Welcome to the First Baptist Church Music Ministry. Music has been called the universal language. No other medium transcends countries and cultures as music does. We are taught in scripture to "sing and make music in our heart." At First Baptist, that is what we strive to do in both our Blended and Contemporary services. From two years old up through the Senior Adult JOY Choir, music and ministry are taught hand in hand. It is our desire that the people learn to worship God in spirit and truth so that in turn, they can lead others in worship. As you look at the opportunities of service available at First Baptist, I hope you will consider being part of this exciting ministry. While most Children's Choir begin at age 3, we like to get them started early with music. Emphasis is placed on teaching basic musical skills and instilling in the children the joy of singing for God. Beginning with our first graders, in-depth musical skills are taught. Part singing, harmony and music theory make up the curriculum of this choir. They meet to prepare to lead in worship from time to time. This choir of over 100 voices provides evangelistic, uplifting and celebrative music for both of the worship services each Sunday. Emphasis is given to choral precision and musical integrity, but the spiritual side of singing and leading worship is also essential to this choir. Music reading skills are helpful, but not required. Our rehearsals are a combination of fun, fellowship and hard work! The instrumental ministry is open to all instrumentalists Middle/High School age and up. In the 9:10 a.m. service, an orchestra is used to accompany the choir and congregational music. They also accompany the choir for any musicals presented throughout the year. This group provides special music periodically in the 9:10 a.m. service. Smaller ensembles are also chosen from these players for special selections during the year. Scot McGuire is the director of the orchestra. Scot holds a Master's degree in music and plays several instruments. The 10:30 service uses a praise band composed of drums, guitars, keyboards and occasional brass and woodwinds. Our older adults have a great time of fun, fellowship and singing together each week (September - May). 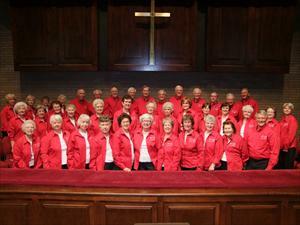 They present musical programs at Christmas and in the spring and have been the featured choir at the South Carolina Senior Adult Convention. They also participate in a choir tour each spring. There is no audition so come join the fun! The Handbell Choir plays in our Sunday services throughout the year and is featured at Christmas. The five octave bell set has just undergone a major refurbishment. Although previous handbell experience is not required, you should be able to read music.